Acne is a very common skin condition that affects millions of individuals globally. The pimples can erupt from anytime between teenage years till the time you reach in your 30s or 40s. Acne lesions usually appear on the face, back and chest region. 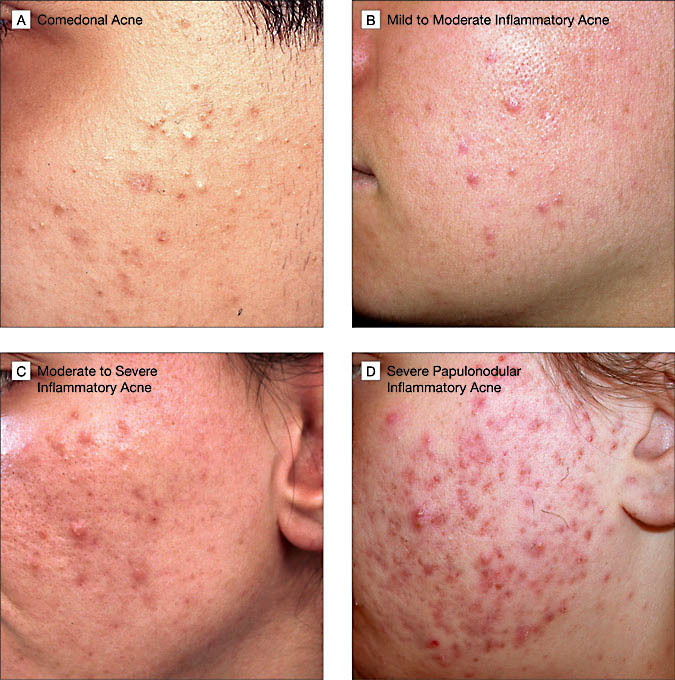 An interplay of various factors lead to occurrence of acne. Oil production in the skin is increased by sebaceous glands over activity. This leads to clogging of skin pores in which dust and bacteria gets trapped. Increased stress, hormonal imbalance and heredity are the major factors that affect acne. Acne is also aggravated by exposure to sun. How acne does affect your skin ? As a result of clogging of skin pores, blackheads, whiteheads, pimples and pustules may appear on your skin. Your skin can also get inflamed and irritated. Acne if not treated in time can also result in scaring due to acne. To diagnose acne, a dermatologist will first examine your skin to make sure you have acne. Other skin conditions can look like acne. If you have acne, the dermatologist will Grade the acne. Grade 1 is mild acne. Grade 4 is severe acne. Depending on the extent of the problem, you may be recommended medicines which may be topical (applied to the skin), and/or oral (taken by mouth). The doctor may suggest using more than one topical medicine or combining oral and topical medicines. Along with this, some personalised procedures may be prescribed based on your skin. Chemical peels: Chemical peeling agents like Glycolic, Salicylic peels are recommended to treat 2 types of acne — blackheads and papules and also to decrease the chances of scarring. The number of sessions and frequency depends on the severity of the acne. Microdermabrasion: This procedure helps in cleaning the pores of the skin deeply, improving scarring due to acne and helps in making the skin look and feel smooth. Acne treatment by clearing pores: Various pore clearing treatments also help eliminate acne. Some of these are Actinage peel, AESTHERA Isolaz etc. Laser treatments for acne: Laser resurfacing techniques and injection of collagen are helpful in refining and clearing the skin of acne scarring. It also makes the skin smooth. When even the best skin care products fail to show results, chemical peels can provide a more drastic solution. If you’re looking to just treat acne, blackheads, or something similar, you may want to talk to your doctor about whether undergoing a salicylic acid peel may be a viable treatment option for you. Unlike other chemicals peels, such as the Jessner and TCA peels, the salicylic acid peel was not designed to lighten hyperpigmentation or to remove fine lines and wrinkles. However, although its effects are usually superficial, it can diminish minor wrinkles and lines. The number of treatments and the timeframe for visible results will vary from person to person. One individual may need two treatments while another may need five or six. Ultimately, this will depend on the skin condition that you are attempting to treat and the severity of the skin damage. For example, if you are receiving the peel for blackhead improvement, you’ll probably only need two or three salicylic acid peels. However, if you’re treating moderate acne, you may likely need about six treatments – more if your acne is very severe.